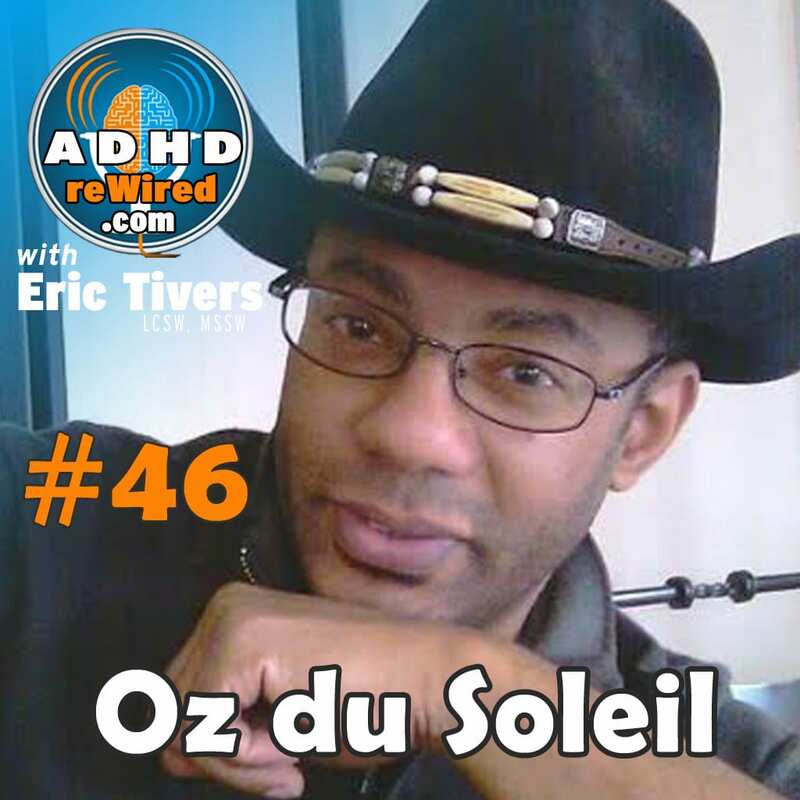 A trainer, consultant, and expert for Microsoft Excel, Oz du Soleil joins us to discuss not only the near-infinite possibility and flexibility of Excel, but also the trials and tribulations of his time struggling against ADHD prior to being diagnosed. From his time at the Navy’s Nuclear Power School though to his future job where he discovered his affinity for Excel and data management, Oz has become aware of both his strengths and his shortcomings and seeks to own all of it while moving forward with his life. Oz answers many of Eric’s questions regarding Excel and shows his passion for the complex data management and structuring that has outlined his career. Oz works as a trainer and consultant to both individuals and companies for Microsoft Excel. His mission in life is to rid the world of crap data and the unnecessary misery it causes. Oz is scheduled to speak at an upcoming business analytics conference this April. He was diagnosed with ADHD at age 38. Living in Portland, OR, Oz enjoys good burbon, is an author of the new book Guerrilla Data Analysis: 2nd Ed., which he co-wrote with “Mr. Excel”, Bill Jelen, and plays bass guitar. Last November, he decided work towards a dream of eventually moving to Portland, Oregon. This past August, he put all his belongings in a car and drove for sixteen days cross-country to Oregon. What was it that lead you to your diagnosis? Playing bass guitar was one of the endeavors that was both very interesting and motivating in some ways, while also being greatly challenging in others. Any tasks that concerned straight-forward memorization were hard to manage. In order to manage these challenging tasks, he developed a Microsoft Excel system to organize the music and songs on a grid. Clutter became a problem. Papers and other items would begin to pile up until Oz would reach a breaking point an trash a large bunch of material at once. This repeated as a cycle for some time, so he decided to visit a therapist for help. Mentioning to some of his friends that he was taking Adderall, some told him they had used it to help them party all weekend, and others help them study for finals. Eric: As someone with ADHD who takes medication, it becomes a problem when people abuse stimulant medication. Part of the reason it’s so challenging for those who need the medication to obtain it has to do with people abusing it. Letting people abuse it only perpetuates the problems that lead to it being hard to obtain to begin with. During college, do not tell your friends you have ADHD, and remember to lock up your medication. Ironically, the task initiation, planning, organizing, sequencing, and time management needed to maintain legal access to ADHD medication are exactly the qualities those with ADHD tend to have problems with. Oz: One doctor would charge $80 a visit for the fifteen minutes needed to write a prescription. Without the availability of refills, I would have to visit every sixty days or so. Oz would often become hyperfocused on researching and learning about topics that had nothing to do with his life or what was relevant to making progress. During his time in the Navy, Oz went through courses within Nuclear Power School. In order to be accepted into the program, he had scored high on his entrance exams. However, once he began the actual training, he started falling asleep in class. Eventually failing out of the program, du Soleil had to come to terms with himself and how he simply didn’t like tasks where he has to sit in one place for hours. He tries not to use his ADHD as an excuse to others about why he is the way he is. Eric: It’s okay to use ADHD as an explanation rather than an excuse. Customers would call in to complain where he used to work. Despite everyone seeming to be doing their jobs very well, there would still be a lot of complaints. Upon looking at the data himself, Oz found a lot of flaws. In service to the customers and his fellow employees, Oz would fix these problems regularly. Oz’s director noticed his analytical skills and brought him in as a partner to fix problems. Beyond work, du Soleil would use Excel to organize his song arrangements and write down notes on structure for use within his band practices. Oz created a “Naughty–Nice-ometer”, which is a playful way to use Excel that uses a menu of different actions that could be considered naughty or nice and assigns them a point value. Lying, for instance, could be −100 points and helping a sibling could be 30 points. It also counts down days until Christmas. Obtaining data is only one aspect of what is important with processing information through Excel. Finding accurate, clean, trustworthy data is another important facet of data processing that depends greatly on knowing where to look and how to organize. The most common use might be budget management. If you have a video collection, it could be categorized by any number of criteria, like the video titles, actors, genre, release year, or even which ones you plan to sell. When managing a large Thanksgiving dinner and deciding who to invite versus how many people you can accomodate. Eric: During the ADHDreWired Coaching and Accountability group, we tried to rotate each member to be paired with a different accountability partner each week. Would there be an easy way of doing that in Excel? Oz: It’s possible to do, yes, but I believe there’s already a round robin tournament generator online. Sometimes, being the most efficient means finding the right tool for the job, and though Excel could do this, it would probably be easier to accomplish your goal using this system another person has already developed. However, when adding the variable of some people choosing to not have a partner, Excel might end up working better. Interesting tasks Excel can perform include : collecting data off of a large number of web pages at once and presenting it in a way that is sortable, automatically collecting and organizing one’s bank account data alongside their budget at the same time, generating custom .pdf forms for businesses looking to set their goals going forward, the Naughty–Nice-ometer, building applications within Excel that can be embedded in web pages (such as a “break even” calculator that changes color depending on the financials entered into the form), etc. Eric: Would you be able to create a way to clean up one’s files and folders on their computer? Oz: That seems more like data analysis coupled with issues of the process of creating files and folders. The system that could be made to handle a situation like that would only be as effective as people’s willingness to adhere to a process that makes use of that system. You just developed the next revolutionary application that changes the face of how people work while being a best-seller across the world. What would you call that application? If you could substitute yourself in for the bass player of any band of your choice, which band would it be? After your presumably successful collaboration as bass player with the band of your choice, you collectively decide a new name is needed for the group. What should that name be? This is the your last chance: If you’re interested in being a part of the next ADHD reWired accountability group, please visit EricTivers.com/CoachingreWired. On Monday, 1/12/2014 at 1:00 PM Central Time, Eric will be presenting the live webinar “Productivity 2.0: Smart Tools and Smarter Apps for Getting Things Done with ADHD”. Those who attend live will have the chance to sign up for the Coaching and Accountability Group for $200 off of the full registration price. Only those who attend live will be eligible.